Sometimes you just have to try it! I am probably dating myself with this image, but I think Mikey can teach us a lesson…Sometimes you just have to try it! When considering the Week 4 blog challenge, the graphic “5 Ways to Lay the Foundation for Innovation” by George Couros resonates with me in my role as a technology integration specialist. I should mention that I am not a huge fan of that title because it seems to work against the first point in the graphic-Powerful learning first, technology second. I really see my role as more of an instructional coach, but I digress…point number four is my focus! The quest for educators who are in my position, no matter the title, is to get teachers to just try things. They may or may not like them, but they have to give new ideas and methods a try or they will never know. Sort of like trying brussel sprouts for the first time! With this in mind, I try to create learning situations where educators really have no choice but to try these new ideas. A couple of recent examples in my district come to mind. What if there are no experts in the room? What if we don’t have enough ideas? How do we ensure that everyone is where they are supposed to be? Vote with your feet…ummm…what if teachers just leave? I wish there were only four concerns, but the point…they said let’s do it, we did, and people liked it! There was nervousness from teachers on the day of the event, but generally the above concerns did not come to fruition. We had more than enough ideas to fill forty-five session slots and administrators just trusted that teachers would be where they were supposed to be! Surveying the participants after the event allowed them to share the good and bad of the event, but what we found overall is that people liked the format. The response to the very last question (graphic below) almost brought a tear to my eye! The survey “required” some type of response on the positives and negatives, but in the end, teachers would do it again! I cannot tell you the number of teachers who have emailed and stopped me in the hallways to say that they were pleasantly surprised because they were not looking forward to it, but in the end enjoyed it. More specifically, a P.E. teacher stopped me and said that normal inservice topics don’t seem to apply to them, but the Edcamp style was different. Another example of creating meaningful learning experiences involves conducting a Mystery Hangout for an elementary building in my district. The building principal (@kate_wyman ) asked me to conduct one with her staff. This principal is very open to new, innovative ideas and she wanted her staff to experience it. After finding a willing and experienced Mystery Hangout school (thanks to@MindySouth) in Farmington, Missouri, we conducted one at the March faculty meeting. The teachers seemed to enjoy it at the time, but the best part was the video message I received the next day from a 6th grade teacher (@theresescifres ) and class who had just set one up. That teacher went to school, put out a call on the Google+ Community (Connected Classroom Workshop) that I had suggested, and set one up the day after that faculty meeting! The principal also sent me an email saying that one other teacher had scheduled one, and two other teachers were interested. Again, that almost brings a tear to my eye. Specifically, these two experiences make me see the power of creating meaningful experiences rather than just telling teachers about them. I can honestly say that too often time constraints have caused me to rely on just telling teachers about the innovative “stuff” that they can be doing rather than actually creating those opportunities that allow them to experience the possibilities. My next goal is to create an experience that proves the power of connecting on social media. 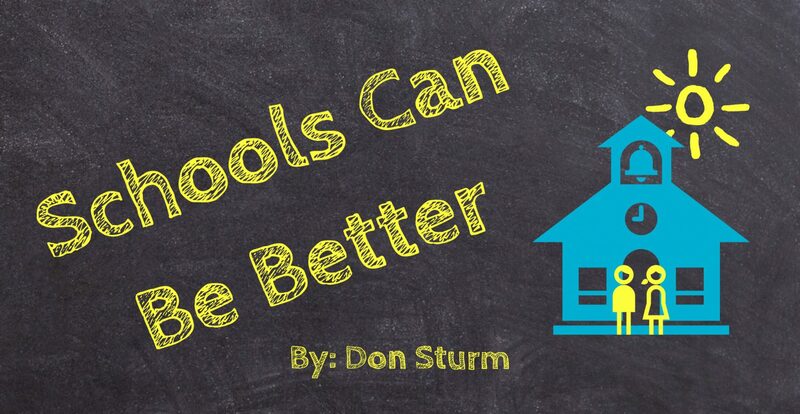 If I can get teachers and administrators to experience the benefits of Twitter or Voxer (my new favorite…look me up @dsturm823), I think they will find that they do like it and that those experiences can lead to richer classroom experiences for their students or staff. When given the option of going from Point A to Point B, a true motorcycle enthusiast will always pick the route that has the curviest roads. We might be able to get to Point B faster by taking the straight road (sometimes we ride 200 miles to go 60), but it isn’t as exciting and memorable as those roads that are scenic and challenging. You gain a greater skill set and appreciation for life when you take these curvy roads! What if this was the philosophy that dominated the field of education? Many teachers feel that the best way to get information across to students is the linear model…the straight road. The kids will still learn this way, but it isn’t as exciting as learning the random and non-linear way. Learning in this way can be challenging and messy, but what you learn sticks with you longer. The curvy road way of learning is just a more exciting and eye-opening experience. Honestly, I think it is higher quality of learning. We deserve to give kids the most exciting and memorable education that we can..let’s start taking the curvy roads and not the straight ones! This view over the weekend from the driver’s seat of a small white bus (the kids call it the white rhino) while taking my scholastic bowl team to a competition caused me to have a deep thought. The kids just trust us! As I looked in the mirror, every kid was asleep on that REALLY long ride. This may not sound like a huge surprise, but it got me thinking that they trusted me enough to not give a thought to me driving them. They have never questioned my ability to drive it or my safety record. I thought really hard about this to the point that I was more aware than normal. I looked a little more closely when I had to cross traffic or go through a busy intersection. Teachers and administrators should not take this trust for granted. Plain and simple, we have to keep in mind that students trust us to do what is right! It is all about taking risks! I think we hear the mantra “take risks” all the time in the field of education, but the nature of our schools makes it difficult to go too far out on a limb. Personally, I think this is one of the issues holding schools back from getting better! There are always those who are working against teachers and educators taking risks because it will upset the way that things have always been done. Having this risk taking characteristic is something that I have prided myself on from the time I started my teaching career in 1991. Obviously, the degree of risk taking varies from year to year, but I have always held the belief that you have to step out of your comfort zone to truly grow. Moving from the classroom to technology integration specialist has given me the opportunity to encourage others to take risks. So much of my current position involves getting educators to try new ways of doing things, which instantly takes them out out of their comfort zone. It takes a nuanced approach on my end because not all teachers and administrators are as comfortable as I am with taking risks. My style is to try to get teachers to think about what they want from their students in the classroom, which many times involves expecting students to step out of their comfort zone. If they expect this from students they should be more open to risk taking in their classroom/school. My philosophy is that no one should expect something of another person that they would not expect of themselves. The fear and trepidation that comes from risk taking is what makes it such a valuable experience. If the risk results in a successful outcome, the confidence gained from that experience is invaluable! Conversely, if the risk doesn’t turn out successful, that experience also provides a teachable moment. We have to start looking at risk taking as a win-win situation. Risk requires a growth mindset toward the idea of failure. Failure should be a learning experience, not an excuse to quit innovating. If we expect our students to be resilient and learn from failure, we have to be prepared to do the same thing! Wednesday night I had the opportunity to view the educational documentary Most Likely to Succeed. I had read the book a couple of years ago, and the movie was thought provoking. It really forces the viewer to think about how education is currently delivered to students. The movie is not yet available for purchases; instead, you purchase a one-time screening license for $350. The reason for this method of distribution, as stated by the executive producer Ted Dintersmith, is to “force” people to view it in groups and have a discussion about the ideas presented in the movie. While I would love to be able to encourage people to buy/rent the movie, I respect the philosophy behind not releasing it. This movie is really meant to be seen in groups! I am going to push to have a community viewing for the community where I work to truly generate some conversation about how schools need to change. However, I would like some feedback from those elementary teachers and administrators. How do you see this working at the lower levels? I want to be able to provide specific examples of how the ideas that are present at High Tech High can be implemented in grade schools. It is one thing to say that a high school kid won’t learn the same breadth of content in this new paradigm, but how do kids learn the basics at the lower grades while still experiencing this “new” type of education? Is what is presented in the movie really more for middle and high schools? I have started a Google Doc where people can share their thoughts. Hopefully this is something that could help others who have the same types of questions. Please feel free to share the Doc with others.